Previously, on MinerBumping... As the CEO of Harmony Order, Governor MrLee was entrusted with the safety of everyone in the corporation. When he chose to violate the Code, he broke that trust--and there was a great reckoning. When the mighty CODE. 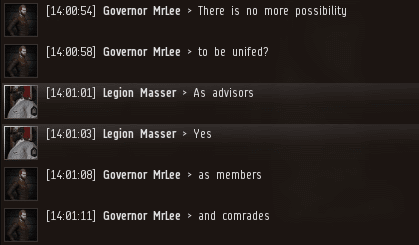 alliance made highsec too dangerous for Harmony Order's bot-aspirant antics, Governor MrLee led his people into nullsec. Alas, Governor made the mistake of renting space in the middle of an active war zone. He eventually decided to give the order to evacuate, but his corpmates were angry about all of the ships they'd lost in null. There was also much consternation about the fact that Governor had used alliance funds to pay for the privilege of renting the cursed space in nullsec. The rental fees cost billions--much more than he would've needed to pay for a mining permit. Every greedy carebear thinks the same thing: "Those other miners may pay 10 million for a permit, but I'll find a way to get everything I want for free." But the more they disobey the Code, the more they end up paying. Governor found himself in the middle of an angry mob. All he could do was apologize and promise to be a better CEO in the future. Despite his apologies, Governor's fellow alliance members struggled to forgive him. They weren't quite sure he'd gotten the message yet. When first he resolved to rebel against the Code, Governor imagined himself as a conquering hero, a leader of men. Now he was reduced to a pitiable state. He was a beggar, pleading for forgiveness. 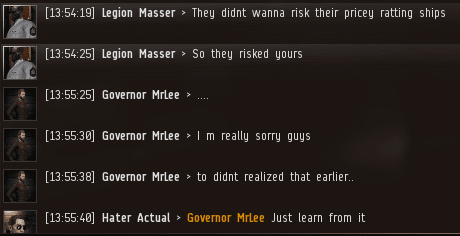 Governor's only defense was that he had been deceived by his nullsec hosts. But the fact was, the sole responsibility for the failure rested with Governor himself. It was he who had chosen to treat the Agents of the New Order with disrespect. And that led to every bad thing that came after. As the airing of grievances continued, Governor began to feel uneasy. How many times did he need to say he was sorry? For the first time, Governor considered that his administration might not survive this debacle. The Agents had warned him this would happen. Governor's world was crumbling all around him. Jamey wrote: "Every greedy carebear thinks the same thing: "Those other miners may pay 10 million for a permit, but I'll find a way to get everything I want for free." What a hypocrite. Jamey's chode. slaves shower him with ISK, he gets everything he wants effectively for free. And he laughs all the way to the bank. Dang Chodeanon. I'm going to donate isk in New Order shares just to make you more salty. I'm doing it right now! I always laugh that AG and salty bears like Chodeanon are really just our biggest fans but they only know how to relate to others in toxic and dysfunctional ways. I also generally make fun of people who use as their primary device of arguing just childlike name-calling rather than an actual attempt at debate or using logic. "CODE. sounds like Chode so ill just say that" is how kids trash talk in grade school, because they are kids with undeveloped minds, and that's all they can come up with. It's funny how much most of the salty bears and AG really are just underdeveloped emotionally and intellectually. You are absolutely right. The sooner the fanbois get to Ganking the sooner they will appreciate James' vision of High Sec! A much more mature appreciation for the video game we all love. 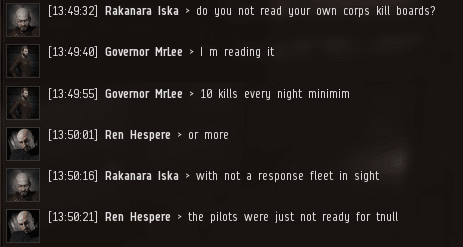 Chodeanon is a poor highsec rebel. It is all about the isk but is a highsec miner. Such a confused old sour puss. Haha that's a great observation VW. ChodeAnon does follow the stories with conscientious regularity. What if he has a Tourette's-like syndrome that prevents him from expressing his feelings in a positive way? Viirilithizu Ward wrote: "childlike name-calling"
There is likely some truth to this. Overmind Nimenen talked insane trash, and yet he started ganking with glee. Likewise, Adrien Vexier is notoriously incompetent AG who hurls endless vulgarities and threats. However, he messaged me privately and said he actually respects us, and he only roleplays as an incompetent moron, and in his spare time he hunts miners in secret. "Viirilithizu is a beautiful word in the language of my people, "
Sure it is, chode. slave, sure it is. Links please. Governor MrLee's eating humble pie. There is an ancient tradition of moving meatshields into the southern reaches of Deklein. These ones paid for the privilege!